Lansdowne, Virginia (November 13, 2018) – UNO Translations and Communications is proud to announce its twentieth year in business. The company was founded November 1, 1998 and celebrated its anniversary with a fiesta at the Tower Club in Tysons Corner on November 1st. UNO was founded by Ms. Brigitta Toruño. Of Ecuadorian and Argentinian heritage, Toruño clearly remembers acting as an interpreter for her parents as they bought their first home in Virginia. Since then, she has made it her mission to break down language barriers wherever possible. The theme for the evening reflected Ms. Toruño’s gratitude for her clients, partners and linguists as well as her family, including her son Guillermo, who manages the North Carolina office. On the Dia de los Muertos, (Day of the Dead), she paid tribute to her entire family and her ancestors all of whom have encouraged and inspired her over the years. In honor of the anniversary, Ms. Toruño made donations to two local non-profits that strongly reflect her own values. 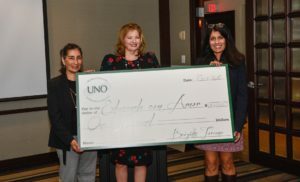 She first donated $1,000 to Educando con Amor (Educating with Love) which seeks to provide less privileged families with practical life skills, including Spanish instruction for young children and English instruction for adults. Ms. Toruño also made a donation of $1,000 to the Children’s Science Center which provides an interactive lab designed to inspire a love of science, technology, engineering, and mathematics (STEM) in children, with plans to build a 70,000 square foot museum in Dulles. UNO Translations and Communications offers translations and interpretations in over 200 different languages. In 2011, UNO began offering consulting services, assisting companies wishing to do business in other cultures. Five years later, UNO introduced phone interpretation, allowing immediate access to an interpreter, 24 hours a day and 365 days a year. The company also offers narration and voice-over as well as sign language interpretation. UNO Translations and Communications is your ONE source for translations and interpretations in over 200 different languages. Helping companies do business in other cultures is what we do best. For more information, please visit our website at www.unotranslations.com or talk with us on Twitter or Facebook.